There are many different display technologies such as LCD, OLED, EPD, and ECD. They are all based on fundamentally different technologies with various driving requirements. Even so, all of them share some basic ideas of how to drive them. In this article, I will explain some fundamentals in display driving. This is relevant whether you are a professional engineer designing display applications or if you are a hacker exploring seven segment displays for your Arduino projects. If you are just interested, well, this article is for you as well. There are two main categories of displays; segmented (left picture) or graphical (right picture). In a segmented display, the content on the display has to be predetermined (it can be numbers, seven segment displays, symbols, characters), while a graphical display is generic and can represent any given picture. 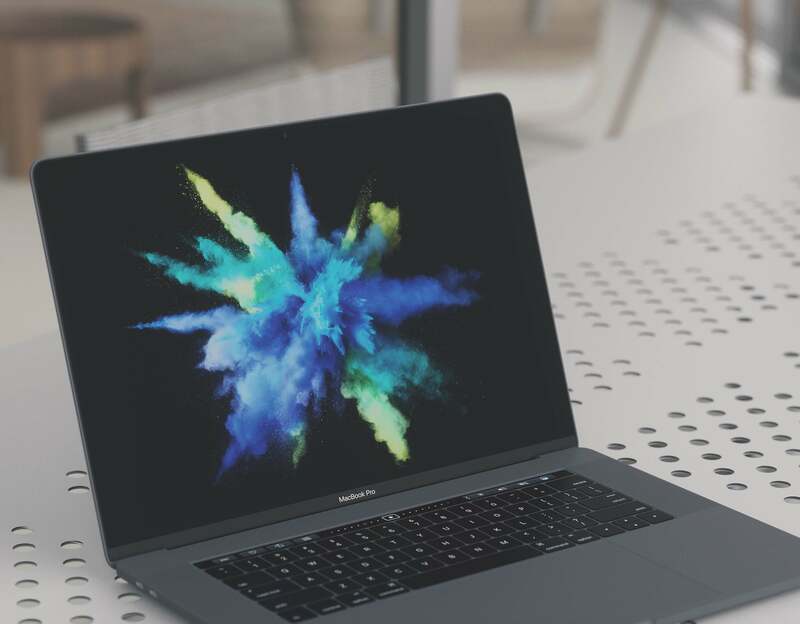 The segmented displays are generally cheaper (even if they are custom made) while graphical displays offer more flexibility in terms of the content displayed. These display types can be driven by multiple methods with different degrees of complexity. A general guideline is that more pixels come with a higher driving complexity. There are two main types of driving, direct drive suitable for a low pixel count or matrix drive that can handle millions of pixels. Direct drive is a common driving method for segmented displays such as seven segment displays. It is a very simple option where each display segment is connected to a pin. A segment is addressed simply by setting a voltage to the targeted segment. In some cases this type of display can be driven directly from many microcontrollers, eliminating the need for a dedicated display driver. This, in turn, reduces the cost of the overall system. This is the case for the Rdot display which can be connected to basically any MCU with accurate driving voltage. An advantage with direct drive is the possibility to address all the pixels at the same time. For LCDs, direct drive is the driving method that offers the highest contrast. The drawback with direct drive is the high pin count for a display with lots of segments. For a display with more than 100 segments direct drive is not recommended. From 30 to 100 segments, direct drive could be a good option. Below 30 segments a direct drive is very often the best choice. 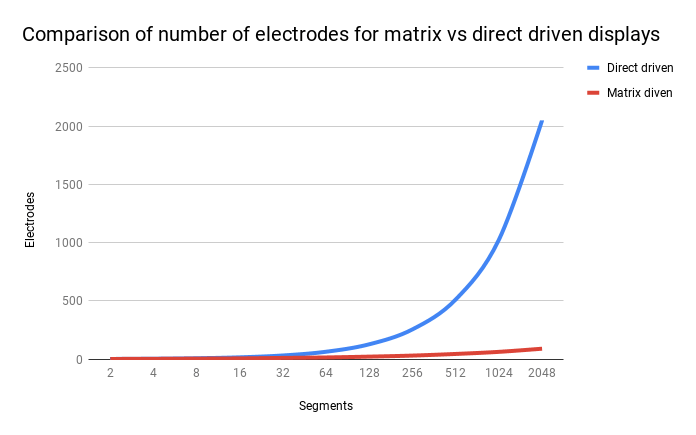 In the figure below I'm comparing direct drive and matrix drive in terms of electrodes required for different segment count. To solve the issue with an unreasonable amount of electrodes, the segments, or pixels, has to be arranged in a structure according to the figure below. This can be done with both segmented and graphical displays. 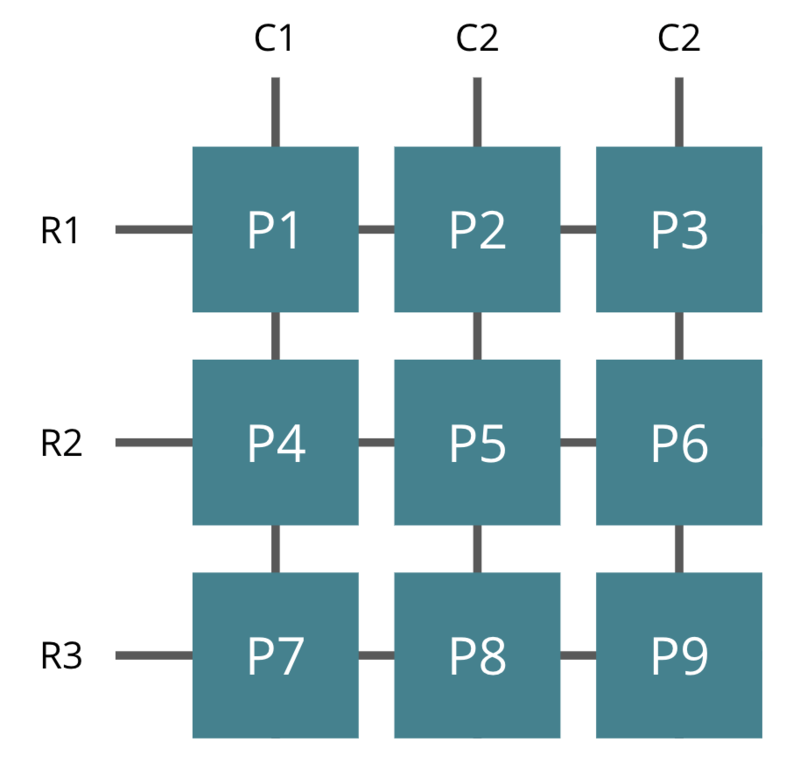 For example, addressing pixel 2 (P2) is done by addressing column 2 (C2) and row 1 (R1). 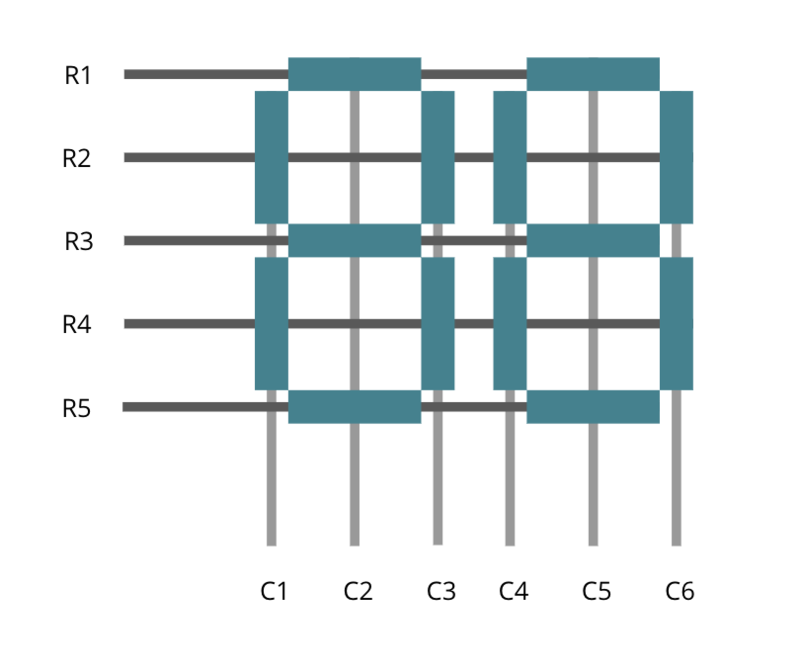 In a passive matrix display, pixels are addressed row by row, this is called time multiplexing. That means that all pixels on row 1 are updated first, then all pixels on row 2, etc.. 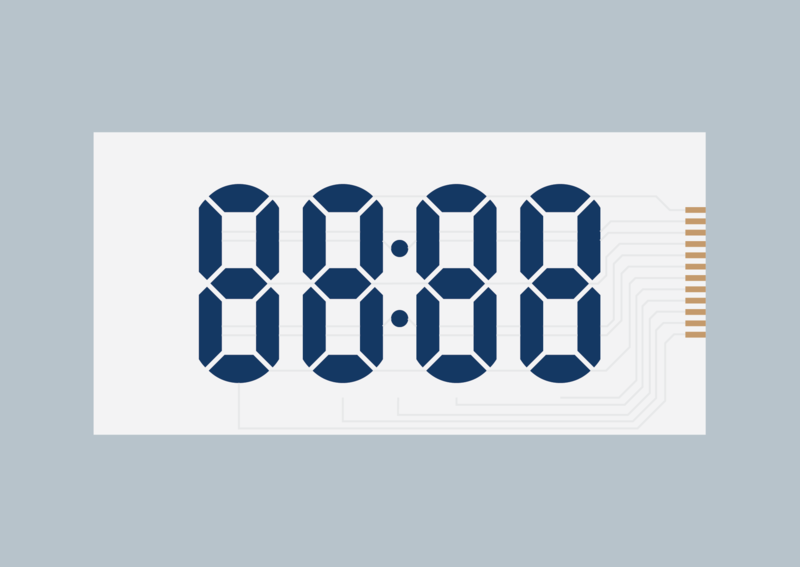 This means that for a display with three rows, each row is only addressed ⅓ of the total time. On retro displays, it is sometimes possible to see this effect as a continuous sweeping across the screen. For LCDs, this reduces the contrast of the display which, in turn, limits the total number of rows possible. This method is often called multiplex driving for segmented displays. Passive matrix drive is a cost-effective method to drive displays as it doesn't require any additional hardware. However, just a few display technologies have the characteristics required for passive matrix drive. 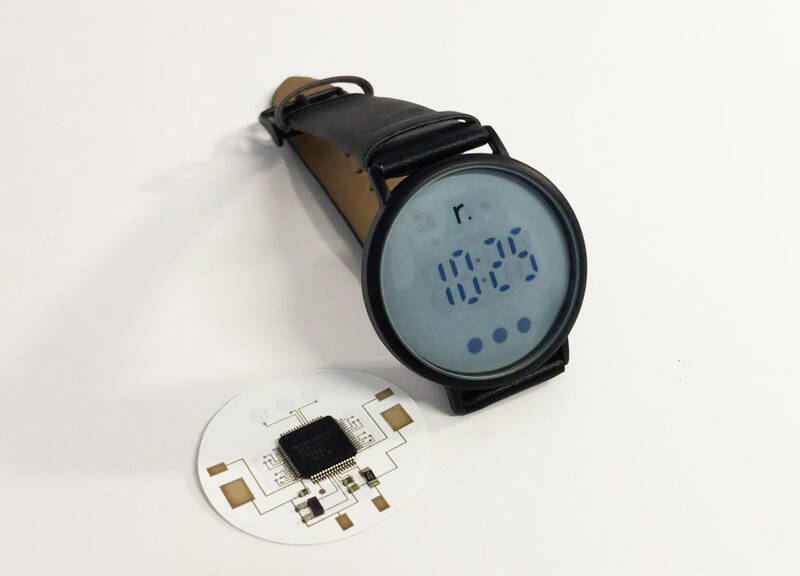 The Rdot display technology has great potential to become the best passive matrix technology. This is because the technology is bistable (can maintain its state even when it is not addressed). This means that when one row is updated the driver can continue and update the other rows without losing the contrast on the first row. Passive matrix Rdot display is still under development but is planned to reach market during 2019. This display will be revolutionary to the display industry as it will be the first passive matrix display in high resolution and the first fully printed passive matrix display. In addition to that, it will still keep the low price point and maintain the bendability. If you want to follow the development, sign up for our newsletter! Any Questions? Just leave your email. The sophisticated display that you most likely are looking at right now is based on active matrix technology. In an active matrix, each pixel contains at least one transistor. More often there are multiple transistors and capacitors. In an OLED for example, each pixel contains a quite sophisticated circuit with 5-10 transistors. By adding transistors to the pixel it can more easily be controlled. This is partly because transistors offer a threshold voltage which is an important feature for a display matrix to function properly. A capacitor, on the other hand, functions as an energy storage when the pixel is not addressed. In this way, all pixels can maintain their state even for a large number of rows. The Apple iMac display, for example, can in this way achieve 2880 rows without a problem. The drawback with active matrix is the high price point since the fabrication requires expensive deposition processes. For that reason, active matrix is mainly suitable for high-end displays. There are two main display types, segmented and graphical. Direct drive is not suitable for graphical displays due to the high number of interconnections between the display and the controller. Matrix drive solves this problem with time multiplexing. There are two types of matrix drive, passive or active. Active drive is only suitable for high-end displays as it is an expensive technology. Passive matrix is a very cheap technology, but so far no high-resolution displays based on passive matrix has been demonstrated. 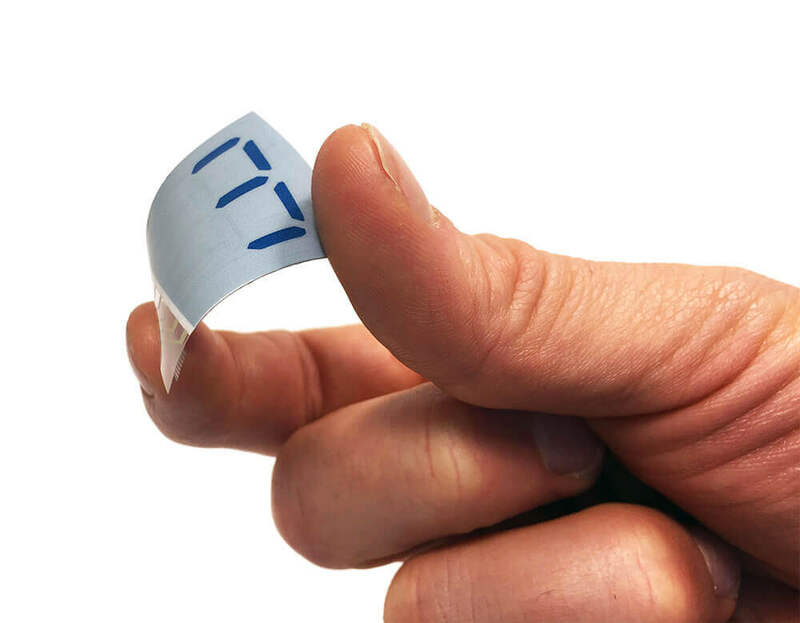 Rdot will revolutionize the display industry during 2019 by introducing a passive matrix display that is both flexible and low-cost.